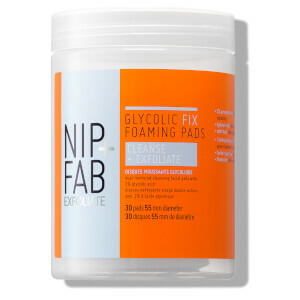 Achieve 2-in-1 cleansing and exfoliation with NIP+FAB Glycolic Fix Foaming Pads. 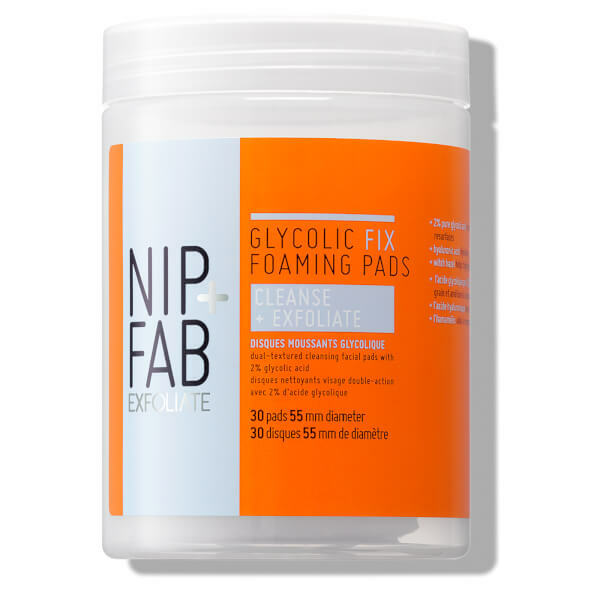 Enriched with key ingredient Glycolic Acid to improve the skin’s texture, Hyaluronic Acid to hydrate and Witch Hazel to tighten pores, the pads produce a gentle clarifying foam. Comprising an innovative dual-action design, one side of the pad exfoliates while the other lifts away excess oils and impurities for a smooth, polished finish. Use daily. Massage pad in circular motion onto damp skin to work lather. Use smooth side to polish and/or textured side to exfoliate. Rinse off thoroughly with water. Aqua (Water), Sodium Laureth Sulfate, Glycerin, Glycolic Acid, Cocamidopropyl Betaine, Polysorbate 20, Sodium Hydroxide, Phenoxyethanol, Sodium Chloride, Benzyl Alcohol, Coconut Acid, Disodium EDTA, Hamamelis Virginiana (Witch Hazel) Water, Parfum (Fragrance), Limonene, Dehydroacetic Acid, Alcohol, Sodium Hyaluronate, Linalool, Geraniol, Citral.